Hi everyone Anyone know how to make the pdf tool render an image with a transparent baground(alpha channel). Everytime I try the background comes out white? Hi Mark, Thank you for your interest in Essential PDF. We do have support for drawing transparent images. IPDFTransparency interface is used for this purpose. It contains property for setting transparency level of drawing images. It also contains several members for setting the transparency-rendering mode. Here is a code snippet for setting transparency: props.Transparency = pdfDoc.CreateTransparency( 77, BlendMode.Overlay); And Here is a sample for you to refer. Please let if you have any questions. Thanks. Ajish. >Hi everyone >Anyone know how to make the pdf tool render an image with a transparent baground(alpha channel). Everytime I try the background comes out white? Hi Ajish Thank you for getting back to me. I have included two Lo Resolution jpgs of PDF''s created by the syncfusion pdf tool and Adobe InDesign. If you look at the jpg of the boy, the background should be invisible. The syncfusion pdf tool does not interoperate the alpha channel of the jpg and renders a white background. Am I doing something that is incorrect? >Hi Mark, > >Thank you for your interest in Essential PDF. We do have support for drawing transparent images. IPDFTransparency interface is used for this purpose. It contains property for setting transparency level of drawing images. It also contains several members for setting the transparency-rendering mode. >Here is a code snippet for setting transparency: > >props.Transparency = pdfDoc.CreateTransparency( 77, BlendMode.Overlay); > >And Here is a sample for you to refer. Please let if you have any questions. > >Thanks. >Ajish. > > > >>Hi everyone >>Anyone know how to make the pdf tool render an image with a transparent baground(alpha channel). Everytime I try the background comes out white? Hi Mark, I went through the images that you send to me. The problem was only due to the transparent Blend mode selection. Use the following peace of code to set transparency. props.Transparency = pdfDoc.CreateTransparency( 77, BlendMode.Darken); Here is a modified sample with transparency settings same as the mode in Adobe Indesign. Please let me know if you have any other questions. Thanks, Ajish. Hi Ajish The transparency mode seems to be a general feature and does not appear be utilising the transparent alpha channel. Antonys top should be white not the colour underneath. 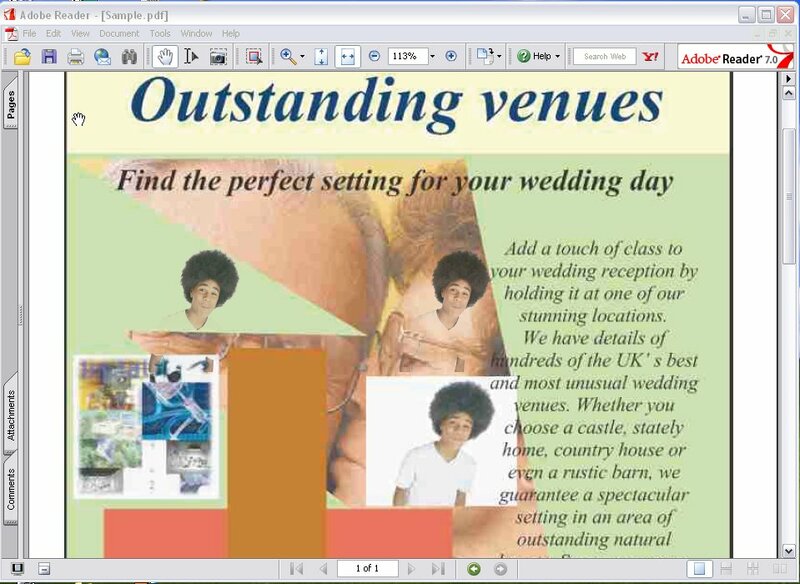 Could you confirm that a transparent layer in a jpg image is utilised effectively by the syncfision pdf tool. Sorry to mention this point again and again but it is the transparent layer embedded within the jpg I am interested in using. Thank you for your patience Ajish. Hi Mark, I have logged a feature request. You can track the status of this issue here. http://www.syncfusion.com/support/features/pdf/Default.aspx?ToDo=view&questId=934 We will try to implement it as soon as possible. Please let me know if you have further questions. Thanks, Ajish.